The aftermath of Black Friday has left shelves open for some new products. We’ve had a chance to (finally) install a Samsung Frame TV the other day. We were impressed with that TV and more impressed with the whole idea of it (see last month’s article below) but, also have our eyes open to some other OLED TV lines, have you seen this LG OLED model OLED65W7P - at only 0.15” thick, crazy. We’ve also seen some development with Sonos. Primarily it’s recent relationship with Amazon’s Alexa. These two are now holding hands and making things out easier than ever before. Simply add your Sonos as a skill with your Echo and you now have voice control for your Sonos house music system. Last weeks’ discounted Play1 speaker has cleared shelf room for Sonos’ ONE speaker, just released. The ONE is basically the lovechild of Sonos and Alexa, with all the functionality we’d hope from both systems! (Added note): As exciting as the above, Amazon is now offered through AppleTV! Christmas stocking stuffers… I ordered and am anxiously awaiting the arrival of a LED lightbulb that, according to the Facebook ad I clicked, looks like a real fire. I plan to rig it in our fireplace for those times it’s easier to flip a switch (or voice controlled) than light a Dura-flame log. 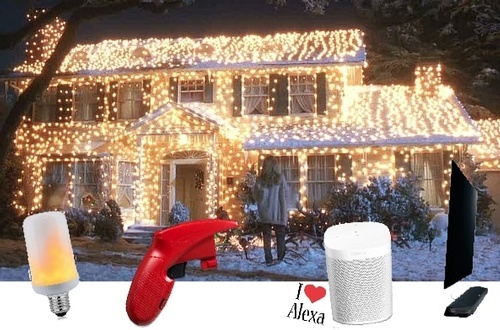 I also ordered the Light Keeper tool, as there are too many lights out here at our “Griswald” house and I’ve been running low on minutes to fix. Keep those lights lit and Happy Holidays everyone!